Chula Vista Mariners, it is safe to say we have had another fantastic summer here at the Marina! Next up, our yearly Baja-ha-ha cruisers are getting ready for the big sail. Can you believe it? This is the 25th anniversary of the Baja-ha-ha! The fleet leaves San Diego in late October every year. Last year the fleet had almost 150 boats depart to Mexico. The crews will have the opportunity to stop along the Pacific coast of Mexico to rest, relax, and to enjoy the local scenery and culture. Also, San Diego is a prepping point for all the crews. Those who have not experienced the journey will have the opportunity to find help and ask questions about what is needed to sail south. Boats from all around the world will participate in this outstanding event. Some of whom will berth here at the Chula Vista Marina as they prep their boats for the big trip. With this said, I advise everyone to befriend these individuals and ask multiple questions about their upcoming journey. The stories you will hear are fascinating. Also, if you have the opportunity to head up to Shelter Island, you can witness them depart the bay together on October 29th 2018. We wish all the Baja-ha-ha travelers a safe and fun trip! Mark & Lynnette Morosky sailed in on their beautiful 44’ Antares named “California Gold” from Shelter Bay Marina in Panama. Raymond Listak bought a nice 25’ Maxum already here at the marina. Dave O’ Donahoe came in on his awesome 46’ Nordhavn named “Navigator”. Kenneth Garrison purchased a very nice 40’ Kha Shing named “Sea Diamond” here in the marina. Jonah Dominek came in with his awesome 38’ Meridian 381 named “Hotel California”. Sascha Merz sailed in his nice Catalina 36 MKII named “Unwinder” from its former home at the Kona Kai. Raymond Press powered down from Driscolls Marina in his 35’ Chris Craft named Thriller. Ryan Wilson came in on his awesome 61’ Mikelson named “Salty Groms” from Point Loma Marina. Thomas Mitchem purchased a nice 30’ Chapparal named “Marga-rita” here in the marina. Welcome to everyone ! Sadly, it’s time to say good-bye to the RV Resort. As most of you know, the Port of San Diego has grand plans for our Harbor. They will be building a new hotel/convention center at Chula Vista Harbor, and they need to use the RV Resort’s acreage for much of this development. We have known this was coming for many years, but until recently we were never sure when it would actually happen. The Port has now informed us we must vacate the premises by March 1, 2019. This is very painful for us, as our staff has given their hearts and souls to Chula Vista RV Resort for many years. But all is not lost, as this gives us the opportunity to finally do something with the Dolphin’s restaurant building. We will be relocating the Gym and enhancing the outdoor patio area and creating a new indoor environment for our Marina guests. And, of course, over the next few years we will be building all new landside facilities just for our Marina tenants. You have a front row seat so enjoy the ride. During our Labor Day concert, we received a very generous gift. Jennifer Trembley shared her talent of fire dancing. It’s something she loves to share along her journey of cruising around the world. Jennifer and Harry Trembly have been marina guests for about a month. Sailing the coast of Mexico is next on their sailing journey. They’re from the San Francisco Bay area where Jen started spinning fire in 2003. In the beginning, she taught herself by watching YouTube videos, but as she became more experienced she decided to take formal lessons from a teacher in San Francisco. Later she came in contact with a performing group and they would perform around the Bay area, fire art festivals, and later at Burning Man (where it all began for her). When performing, her husband Harry stands by with a fire retardant blanket and keeps watch to make sure her clothing doesn’t catch fire. The fire creates its own perimeter so people rarely walk into its path, however sometimes she uses LED Poi’s instead of fire. Jen's performances are truly mesmerizing to watch! Please remember that we cannot dispose of large items, bilge water, or fuel. We can only dispose of used oil. Please do not leave these items at the gates or in the trash cans. If you need assistance in finding a place or a company to dispose of these products, the office has information for a local facility here in Chula Vista. They will take all your hazardous materials and large bulky items. For regular trash items that are too big for the cans on the docks, please bring them up to the dumpster area. The office staff is more than happy to assist you with access to the dumpster. Also please make sure to let the office know of any changes of your personal info, i.e., phone numbers, address changes, new email addresses and changes to credit card info. It is very important that the info we have on file is most current for you. Saturday, October 6, 2018 is our Marine Gear Swap Meet. Tenants at CVM will be granted one free space, any additional spaces or participants wanting a spot will be charged $15 for used items and $30 for new. There will be live music, lots of negotiating, and plenty of good food. This a great way to make a little more room on board and get a couple extra bucks. The event will be held in the north end of the marina parking lot from 7 am to Noon. Please contact the Marina office to reserve a spot at ( 619) 691-1860. October 26 - 28 Tours of US Navy and US Coast Guard ships will be available during Fleet Week 2018 on a first-come, first-served basis. Visitors must be at least 5 years old to tour. For more information go to https://fleetweeksandiego.org/. 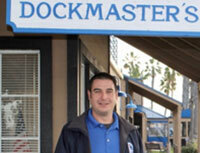 Marina Classes are free to CVM tenants and members of CG Auxilary and US Power Squadron. For all others there is a $10 fee. For more information call the Marina Office at 619-691-1860 . Photoshop - Bring your laptop.